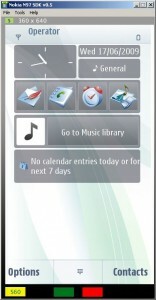 N97 Small Emulator Skin | BDC Software Inc. Recently I have installed and started experimenting with N97SDK 0.5. One of the first things I noticed that the emulator window is huge(due to the 360 x 640 phone resolution) and will be partially off-screen on mylaptop with its low resolution of 1280×800. Creating the actual skin configuration file and the bitmap for the N97 is fairly simple because in portrait mode the phone has only four buttons visible that have to be mapped. Making the new skin file part of the emulator configuration was a bigger challenge and the only way I got it to work is by overriding the original portrait mode configuration file. The only issue I have encountered so far is the partial redraw issue on the right border of the screen. This is a cosmetic issue only and it will not affect the operation of the emulator. For some reason when the emulator powers on it draws the phone screen at incorrect coordinates and later on restores the location to the correct offset coordinates. Weird. Download the n97_small_emu_skin file and unzip it into the epocdata directory in your SDK location. Make sure you overwrite existing files. I have also uploaded the N97_Small_Emu_Image that can be used to easily customize the look and feel. Again, this skin is fairly simple to customize because you only have to define four button positions. Once you open the ini file it should b self explanatory on what to do. Hope somebody will get some use out of this.